This interview is part of our ongoing commitment to connect our community with leading-edge voices in the hydrogen fuel cell space. Fuel cell electric bus technology is increasing its presence in the public transportation industry. Leading experts are critical resources for those wanting to learn more about, and build confidence in the technology. For this interview, we reached out to our partner, David Warren, the Director of Sustainable Transportation at New Flyer of America. David has a wealth of knowledge around electric bus technology, and oversees New Flyer of America’s new Vehicle Innovation Center in Anniston, Alabama. New Flyer of America is a subsidiary of New Flyer Industries Inc. (“NFI Group”), North America’s heavy-duty transit bus leader with over 50 years of experience in manufacturing zero-emission buses (ZEBs). It is the largest bus and motorcoach manufacturer and parts distributor in North America, with 32 fabrication, manufacturing, distribution, and service centers located across Canada and the United States and employing nearly 6,000 team members. The company actively supports over 44,000 heavy-duty transit buses (New Flyer, NABI, and Orion) currently in service. How are technology advancements and manufacturing volume leading to a reduction in fuel cell electric bus cost? To put this into perspective, New Flyer and Ballard Power Systems designed a fleet of 20 fuel cell electric buses (FCEBs) to showcase the technology at the 2010 Winter Olympics in Vancouver, Canada. At the time, each bus cost $2,000,000. Today, it is a much different story. With the enhancements in fuel cell stack performance, improvements to the electric propulsion drive, and reduction in battery costs, we’ve seen an increase in performance and a substantial decrease in overall cost. For example, we are currently producing 25 buses for deployment at three California transit agencies – Alameda-Contra Costa Transit District, the Orange County Transportation Authority, and SunLine Transit Agency. Each bus now costs $1,260,000. This is a dramatic cost reduction that is expected to continue to decrease. I believe if we can get the orders to 100 units and beyond, the price per unit could potentially fall below $900,000. That is an attractive price point for this technology. One that riders and their communities appreciate. How is New Flyer adapting to these changes in powertrain preferences? The zero-emission space is not new territory for us, so the adoption of fuel cell technology is a natural progression. We are zero-emission pioneers, and have produced 6,400 transit buses with electric motors and batteries for over 50 years. With the advances in lithium ion batteries, which happen to be part of the fuel cell ecosystem, we are increasingly seeing fuel cells as an essential component of the propulsion system. 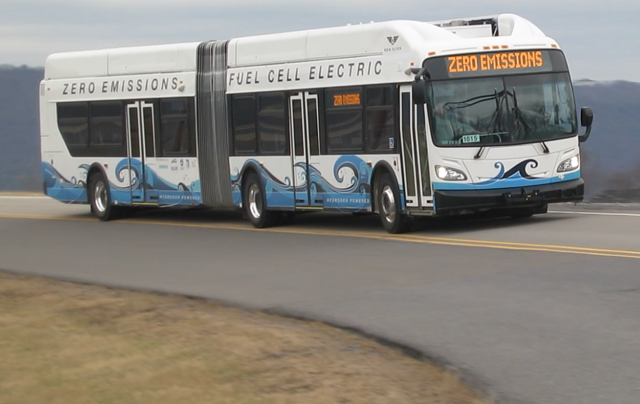 Can you tell us about the Altoona testing of New Flyer’s fuel cell electric bus powered by Ballard fuel cells? New Flyer of America, in partnership with Ballard, developed a 60 foot FCEB with a range approaching 300 miles. This bus was delivered to Altoona and is undergoing the Federal Transit Administration vehicle qualification and validation program for commercialization. The bus currently has 10,000 miles of tracked testing which includes staggered bumps, railroad crossings, chatter bumps, chuckholes, and frame twist types of events that replicate the wear and tear of over 25% of the life of the bus. We’re closing in on the completion of this test, which will occur in the first half of 2018. We also have telematics technology on the bus to track its progress on a daily basis, and are alerted of any forthcoming maintenance or any diagnostics that need to be done. With the completion of this test, New Flyer will be fully prepared to deliver both 40 and 60-foot fuel cell buses to transit agencies, powered by Ballard fuel cells. Have there been any pleasant surprises with the testing or have the outcomes been predictable? I think they have largely been predictable. We all knew that the basic structure of our heavy-duty Xcelsior® bus and the propulsion system (provided by Siemens) was sound. And, with the addition of the fuel cell to create the energy on board, we knew this would be a successful endeavor. We really just validated the confidence we already had in the ability of Ballard fuel cells to provide energy to propel these buses. Can you describe the importance of New Flyer’s Vehicle Innovation Center (VIC) and how it will be used? 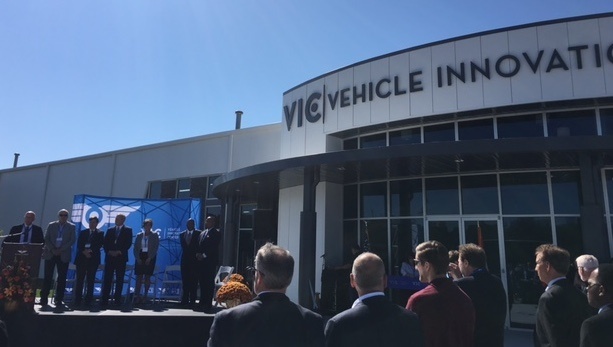 In October 2017, New Flyer opened up the Vehicle Innovation Center in Anniston, Alabama. It is the first innovation lab of its kind in North America, and is unique in the transit industry with its vision to advance bus and coach technology in America (specifically focused on electric and autonomous development). The VIC will be used as a learning environment to share knowledge with transit agencies and demonstrate this technology with hands-on learning experiences that include interacting with a Ballard fuel cell. Harness the positive influence of collaboration, environmental stewardship, and social change to advance smart mobility solutions. Visitors to the Vehicle Innovation Center will gain the ability to understand how to operate, maintain, and plan a zero-emission FCEB system. We recently hosted 25 transit representatives from different agencies across North America, who engaged in a two-day “Electric Bus Essentials” program and participated in intensive learning on the technology and deployment of FCEBs in their transit operations. Agencies who complete the two-day program take in an interactive, immersive, and hands-on experience, complete with riding the Xcelsior electric buses, interacting with multimedia electric bus exhibits, understanding the basics of how a fuel cell operates, and learning how fuel cells interact with both the propulsion system and the energy storage system on the bus. They come out feeling a lot more confident that this technology is commercialized and readily available. We expect to welcome hundreds of guests per year through this facility, including transit authorities, elected officials, industry leaders and more. Together, they will experience and gain a greater appreciation of how to successfully deploy electric bus technology. What is your opinion on the future of fuel cells and public transportation? New Flyer remains confident about FCEBs and the future of hydrogen as an energy source. There are three primary reasons for that. Firstly, when we look at electric bus range, we have to consider the amount of batteries it requires to replicate the operation of a diesel or CNG bus. Batteries are very heavy, even with the latest technology. This affects the operational efficiency and range. FCEBs allow us to store energy in the form of hydrogen, which is much lighter and has higher energy density than a battery-alone system. With 38 kilograms of hydrogen on a 40 foot bus, and approaching 70 kilograms on a 60 foot bus, a FCEB is able to far outdistance a pure battery electric bus (BEB). Second, the time to refill a fuel cell bus is very comparable to a diesel or CNG bus. So, the bus does not need to be out of service for several hours before it can be brought back up to its full energy state. Refueling can be done in about 15 minutes. And third, because of the onboard energy system, FCEBs are lighter than BEBs, and are able to carry more passengers. So the combination of those three factors is a strong motivator for transit agencies to deploy FCEBs. Any parting words for those who are new to the zero-emission space? When you look at what’s going on in the automotive industry, we see major companies like Toyota, GM, Honda, Hyundai, and others investing heavily in fuel cell technology. We’ve also seen what has occurred in the material handling space with fuel cells, and how efficiently and effectively they are operating. This is a clear indication that the industry is headed in that direction. Also, while there is still work to be done in terms of building out hydrogen infrastructure, we see a lot of progress being made in places like California, where fuel cell stations for commercial vehicles are becoming more readily available. It’s only a matter of time before other jurisdictions follow suit. The commercialization of zero emission technologies will allow for continued replacement of internal combustion engines. At New Flyer, we remain confident that fuel cells are a viable solution to power buses and other heavy duty vehicles. The zero-emission revolution is really happening and we’re very proud to extend our leadership position in the industry, with Ballard as a valued partner.